"A fantastic resort for family holidays as there is something for everyone. There are plenty of water activities to try out and sandy beaches to top up your tan!" 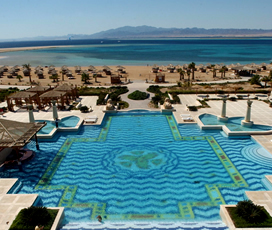 Soma Bay is a gorgeous Egyptian resort situated around 20 minutes from the more famous resort of Hurghada. It combines a series of stunning sandy beaches with the sapphire blue waters of the Red Sea, to make it the perfect destination for those who want to enjoy the hot rays of the Egyptian sun on their beach holiday. It is also a world-renowned kitesurfing centre, with a dedicated kitesurfing facility that is among the best in the world, making it perfect for experts or those who want to try the sport for the first time. 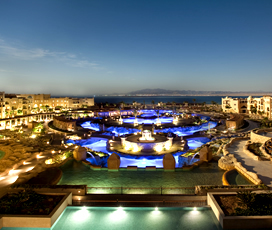 Soma Bay is ideally located for the most unbelievable dive sites, with untouched corals and a large variety of marine. Professionals usually explore Abu Kafan or Panorama Reef, whereas beginners tend to do their training in sheltered waters. So no matter if you are a professional diver or just a beginner, you won’t be disappointed. Modern and family friendly, it is perfect for those who want a traditional beach holiday. An Egyptian resort located around twenty minutes from the more famous Hurghada, it is known for its beautiful turquoise waters, golden beaches and plethora of great activities. The self-contained community is about 10 million square metres in total and is completely surrounded by the Red Sea. Other things of note include a Championship level golf course and one of the finest kitesurfing facilities in the world. Experiencing a dry and hot climate throughout the year, it is hottest during the months of June, July and August, when the average temperature exceeds 30 degrees and the sea temperature is higher than 28 degrees. The coldest month of the year is January, when the temperature is a pleasant 16 degrees. The perfect place for a relaxing family holiday, with its closed nature, it gives an extra layer of security for families with children. The best activities on offer are based around the gorgeous Red Sea, with a myriad of different watersports available, including snorkelling, diving and kitesurfing. The beaches are pristine, and the weather is hot all year, making it ideal for families who want to kick back and relax amidst stunning scenery. Renowned as a kitesurfing destination with the ‘Kitehouse 7BFT’, it is famed for being the best place to kitesurf in the entire of Egypt. 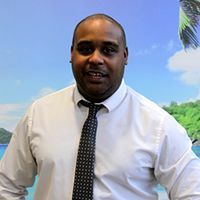 Other activities on offer, include a plethora of watersports, such as: snorkelling, diving, surfing and many, many more, with a large number of companies providing visitors with the chance to rent equipment or take lessons. 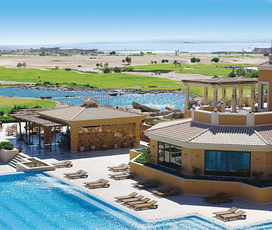 The self-contained resort also has a championship level golf course and more beautiful beaches than you can count, making it ideal for anyone who wants to have some fun in the hot Egyptian sun. As a closed resort community, its nightlife is fair, with a variety of bars and a few clubs, although is not the kind of place where you can stay out from dusk until dawn. 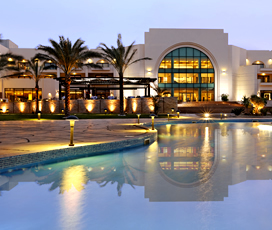 The larger resort of Hurghada is around 20 kilometres away, which is a good option for those seeking more.